I picked this up free on Smashwords and promptly forgot about it due to the sheer amount of books I have. I am glad that I found it again! 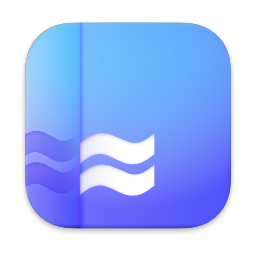 Spinward Fringe Broadcast 0: Origins is a trilogy (Freeground, Limbo, Starfree Port) about Captain Jonas Valent and the crew of First Light. Caught for hacking into Freeground military simulations (and beating them silly) Jason Valent and his crew are offered two options: participate in a high-stakes simulation and win or face court martial for breach of security. The trilogy is filled with high-stakes space battles, hyper space flight, betrayals, rescues, secret missions and a blossoming love story between Captain Jason Valent and his Chief Engineer Ayan Rice. I enjoyed reading it, despite some clunky sentences and dialogues here and there. It's space opera at one of its best and Lalonde has created believable characters who evolve with the story, drawing the reader to love and care for them... and hope they survive. You can pick this up free from Smashwords here. I DID IT, PEOPLE, I DID IT! And you know what, I did it faster than I've ever done before. Normally I'll be just about dying on November 30th trying frantically to beat the clock. This year, the historic 2012, I actually have six whole days to spare. What this really means, of course, is that I now really really really really really need to concentrate on Christmas. You know what? I still owe you the Bali and Phuket posts. I think tomorrow morning I'm going to wake up to listen to Tan Twan Eng. So I haven't been updating you on my progress for a while. I've been busy writing. 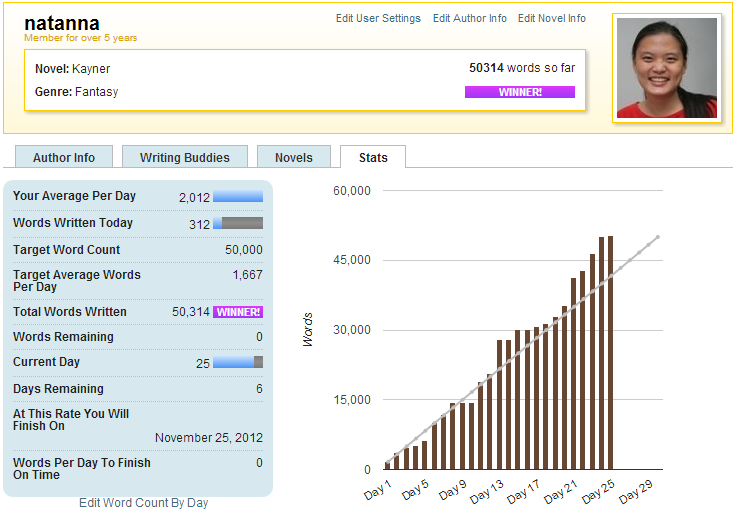 Progress looks good to finish nanowrimo on time this year, though I have a feeling that the story may be longer than 50K words this round. I feel as if I've been jumping from perspective to perspective for some odd reason, but it helps me to figure out what's going on in this story. Sorry, I'm still pantsing it. I should actually go and work on plot, since I'm so bad at it, but I figure I'll work it out AFTER November. 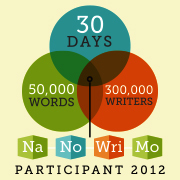 What has really been helping me this year is joining word sprints on the NaNoWriMo group on facebook. What we do is we set a starting time (say :00) and a length (for 20 [mins]), and at the end of the period we check in to see how each of us does. I've figured that my most efficient writing sprint is 20 minutes. I average 700-odd words at 20 minutes, which is interesting seeing that I usually only manage about 400 odd words in 15 minutes. Productivity drops after that, with about 800 - 900 words in 30 minutes. On a good day, I manage 1K words in 30 minutes. The Nameless One floated in the darkness of the abyss, nameless, faceless, formless. It felt the straining of its power against the bonds that held him. A soft creak, like rope being stretched too far, sounded somewhere near the boundary. The magic that held him was growing weaker by the day. If it had a face, he would have grinned like a very sinister Cheshire Cat. As it was, a feeling of smugness pervaded the abyss under Pieterose. "Listen to me," it whispered into the willing ear, bent to his will. "The boy will seek to overpower you. And while he does that, who knows what will happen to Kayner? Evil is closing in on you at Charoite from Under Pieterose, and you will not be caught napping. No, no matter what everyone says, it is best to head off evil from the very beginning." In a distant place, the listener nodded at its wise words. The boy was unimportant. The duel was unimportant. Winning this war with the Unmentionables was of paramount interest to Kayner at the moment. "It is breaking out, Erel, and only you can stop it. Only you have the power and the might as well as the right to do it. No one else," the Nameless One continued, sending a sense of urgency to its listener. "You must do something. Only you see the danger. Everyone is so blind!" The Nameless One chuckled silently to himself. How unaware this old man was! How unconsciously he absorbed everything that the Nameless One whispered to the black recesses of his heart. Oh, if only the Sub Authoruss knew who was really talking to him. Did he really think that it was the voice of the elusive Book? The Book was not in Charoite, the Nameless One knew, though the Sub Authoruss went blindly about the castle looking for it. It could feel the absence of the Book's power on the Seat of Charoite, though it was still somewhere in Kayner. That absence of power was what gave it the strength to push against its boundaries, pushing out until it could project its voice into the very void. Soon, when the Sub Authoruss was within reach, the Nameless One would be able to draw on his magic and strength, like a leech. And then Kayner would be his. If it could laugh, it would have laughed, with evil maniacal guffaws, but as it was, a feeling of mirth spread through the abyss. Time. Time was on its side now. Other things floated in the abyss with it, but the Nameless One ignored them. They were small and powerless against it; broken spirits, Fay, Gnome and human, of those who had tried and failed to usurp the power of the Authorusses. But it was different. The Nameless One searched the countless memories it held within itself, searching through the many faces it had once held. It was one, but many. It was legion. It would soon rule Kayner. On other matters, I attended my first write-in with Patricia at Starbucks NWP last Saturday. It was a nice time discussing our WIP (mine is so plot-holed, argh!) and doing a little writing (but not that much). May possibly meet up with Rabia at this week's George Town Literary Festival so I need to hurry up and do more writing because I won't be free this weekend. Also I met Gina Yap, a writer with Buku Fixi who's going to launch her novel this weekend at the Fest! 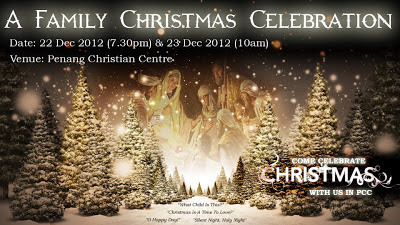 FINALLY, if you want to see what I've been working on with Phoebe, join us for A Family Christmas Celebration at PCC on 22 Dec (Sat) 7.30pm and/or 23 Dec (Sun) 10am. I won a copy of this e-book from Sher's blog last month. I had actually heard about the book much earlier, though I never got round to buying it, so this was a fortuitous win. In a world where being the younger twin of a noble means being put to death, Paul shouldn't be alive. But his twin Rupert is mentally handicapped and his royal parents need a miracle. Thrust suddenly into court life from his life on the streets, Paul must successfully pose as the miraculously healed Crown Prince or face his belated execution. Complications soon arise when his father, King Albert is captured by a vengeful sorcerer. Urchin King is a fantasy story loosely based on The Prince and the Pauper, with many twists and turns of a magical nature. I found the story line interesting and intriguing and it was unique and complex enough not to sound like a simple rehashing of an old tale. Gerlach obviously has a fine sense of story and plot, and the novel was exciting, filled with many adventures that drive the story on. That said, I'm torn between giving this book a three or a four star rating due to the inadequacies of the writing itself. I felt that many of the chapters were short and could have been further expanded upon. As it was, there was a feeling, not quite of urgency, but more of being rushed through the story to the end instead of being allowed to linger in the words and on the page. The lovely Katharina Gerlach (also known as Cat) can be found on twitter as @catgerlach or on facebook at her author page. She is also contactable on her website and blog. You can pick up Urchin King from Smashwords, Amazon or well, as a paperback . 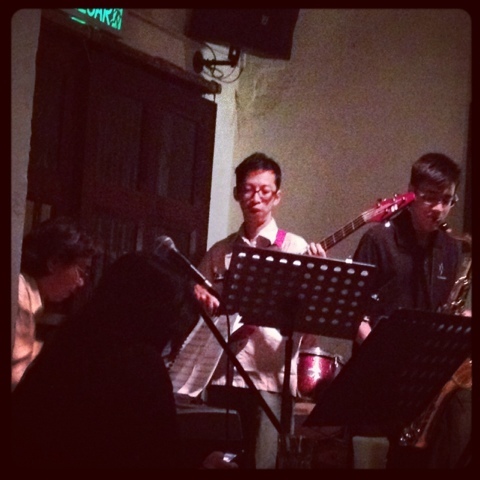 Half remembered faces, half forgotten lyrics, a half forgotten you in the haze of music and drink. You appeared as an apparition, the ghost of jazz fests past. I tried to smile, but it got caught in the middle of the lump in my throat, wondering why you had come. And as the bass walked, you sent chills up and down my spine, remembered bliss of once upon a time. And then you were gone again. Tomorrow's to-do list, because I am too tired and lazy to do anything today, though I really hoped to. I am nothing but ambitious. And to think, tomorrow is supposed to be a holiday. Right now, I'm going to curl up in bed with Oedipus Rex and Bacchae. I had fully intended to write a fireplace post to consolidate certain musings over the past few weeks after reaching my nanowrimo word count for the day, but it seems that this was not to be. 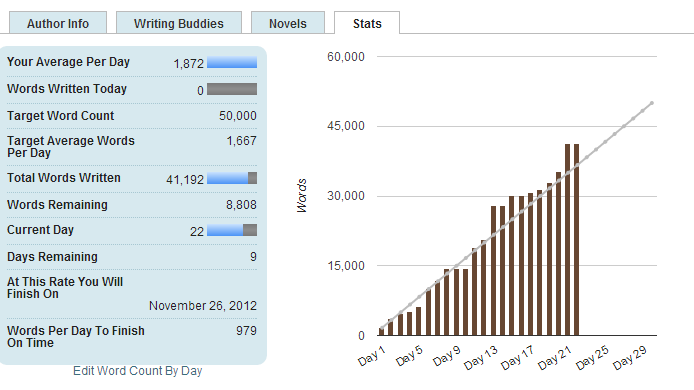 Brief nanowrimo update here: I'm more or less where I need to be, word count wise, and still pretty compact, plot wise. I think I see what's coming in the next few chapters, but other than that, I don't have a clue. The only problem I'm having right now is the fact that the story seems to jump a little from scene to scene. (Stuff to be fixed when editing). For another, I've been distracted researching soundtracks to possibly use in my Creation/Bridge dance/mime thing. As you can tell, I have no idea what to call it. Seeing that the creation of Narnia in Magician's Nephew contributed somewhat to the opening of the Creation narrative, I've been listening to The Lion, the Witch and the Wardrobe's soundtrack and finding that several tracks might possibly fit the feel that I'm looking for. Whether it can actually be danced to, is another matter, which the choreographer will have to figure out. (If it's a no, that's back to more research =/ ). Listening to the soundtrack though, I'm having second thoughts as to whether Everlasting Light (Mono) will actually be suitable for the Bridging portion, especially since the back bit is so long and I don't have any narration for that yet. So much for being all worded out. I guess my frame of mind is not quite right for a fireplace. A gradual realisation came upon him, one that left him frightened. This wasn't Earth. He didn't know if the sun continued to rise in the east and set in the west. He didn't know if the constellations were anything like those he had stared up at on sleepless nights when he had climbed to the roof for solace. He didn't know what kind of animals prowled the woods, or if they were carnivorous. He didn't know anything about the plants that grew in the forest, and if they were safe to eat, or if they were likely to eat him. He didn't know anything about this world. For once, he wished he had paid better attention to the books Yiel had asked him to study. He frowned at the recollection. He had read a lot of books about geography and botany. Had Yiel known? Had Yiel guessed? Whatever it was, he was on his own now, with whatever he had gleaned then. Taking a hesitant step after another, he pushed his way into the Flame Forest. He prayed to the gods that he would make his way out alive. He pondered upon that even as he walked. Were the gods in Kayner the same as the gods he had prayed to back on earth? What if they were different gods? Then his prayer would have been to no effect and he could very well be eaten on the way to Amezine. What was the point in prayer anyway? Did it ever make a difference? It hadn't stopped him from being hurt back on earth, or even from dying, though he hadn't prayed when the Orb had taken him, so maybe that was why he died anyway. What did the gods want? He felt that it was something he needed to discover soon. Hadn't Kayle said that the Authoruss was also the representative of the gods on Kayner? He stopped that line of thought immediately. It irked him a little that he had somehow ingested the idea that he was to be Authoruss. He didn't want to be. He didn't think he was the right person. So what if he had magic? He could hardly control it - well, to all accounts he had improved somewhat recently - and he barely knew anything about what he was doing. It felt more as if he was stumbling in the dark all the time. Except for the rare moments when that other worldly thing seem to take control of him. He shuddered. If that was what it meant to be Authoruss, First Magician of Kayner, he didn't want it. He was his own person, not something to be pulled about like a puppet. I suppose I should start this review with a disclaimer to say that I don’t often read chick lit. You’d more often find me browsing the fantasy/sci-fi shelves than the romance/chick-lit section of the bookstore. Right from the beginning of the book, I started getting really annoyed by the protagonist of the story, Jan Weston. I find ditsy, blond-stereotype girls very annoying, especially when they seem to believe that the whole world owes them a living. And this girl was all that. So she’s broken up over her break up (to non-functional extremes), her mother practically disowns her for ditching a proper University degree to attend massage therapy school (most Asian moms would, just saying), and to top it all off, she’s mean and bitchy to the very people who want to help her: her friend and neighbour Lisa, Lisa’s friend Becki, and the nice (and hot) guy Juan from massage school. It’s as if she’s intent on making things worse for herself than it really needs to be. Jan soon finds out that she can’t survive on her own, and gradually she lets the people she used to look down on into her life, surrounding herself with those who would help build her up, rather than knock others down. By the end of the book, I find that she’s grown enough that I don’t hate her anymore. She’s still a little flighty, but very much more grounded than before, and even quite nice. I'm not sure if that's a good thing or not. 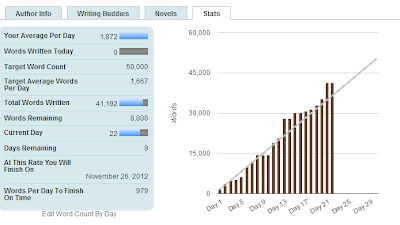 Well, that's what it says about my current nanowrimo novel. I should try some other stuff and see if it changes, because apparently it does. 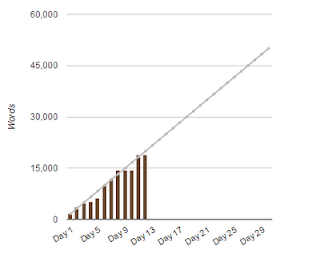 At any rate, this is a belated update on the progress of my novel. I was on target for the first couple of days but slacked on Saturday because I was out most of the day (impromptu breakfast, Christmas practice/meeting, church, friend's grandma's wake). I figured I would be able to catch up on Sunday, but I had a craving for Nando's which landed me circling Gurney Plaza's parking lot for almost 45 minutes, to which I figured next time I want to eat Nando's, I'll go straight to Queensbay or Autocity as it seems that the length of time it takes for me to drive there and park is about the same as the time it takes for me to park in Gurney... so that was almost an hour of writing time lost and then I was feeling under the weather at night, so I decided to curl up on my bed and read instead. But several writing sprints with the Nanowrimo group on Facebook this (very early) morning fixed that and I'm caught up to last night's word count. I hope I'm not confusing you. I'm not quite lucid at the moment. Yiel stared unseeingly at the unwithering lavender fields that surrounded the Charoite Castle. It had been a long time since he had appreciated the beauty of the flowers in full bloom. The brief stop on Earth through the Orb had made him realise one thing: he hadn't lost his sense of smell yet - he had merely been desensitized to the fragrance of lavender after nearly nine hundred years of living in Charoite. Too much of a good thing... was rarely ever good, such as his extremely long span of life. When he reached his thousandth birthday almost two hundred years ago, he had become keenly aware that there were no eligible Purples to take over his mantle. Since then, he had been scouring both Lazuli and Amezine for someone strong enough to train, but there had been none. The Book had told him to wait and be patient, but he couldn't help worrying. What if none came in time? How then would he pass on his mantle? He didn't want a repeat of the Unmentionables Uprising. That had caused Kayner almost irreparable damage, most of it to the beautifully delicate Pieterose. He was nearing one thousand one hundred and ninety years of age, longer than any other Authoruss on record. It was not something he told every passerby, though it would go on record and be released after his death. He felt extremely tired. That trip to earth, though. Something had happened there. The Book hadn't revealed it to him, but he had felt a change in him. A face had flashed in front of his mind, there had been a quick scuffle, and then the Orb had brought him back to Charoite again feeling lighter than before. He did not understand this lightness. He hadn't been light in a long time. "What are you pondering?" Erel asked, coming up behind him and massaging his shoulders. "That face. The one I saw. I wonder who he is." "Didn't the Book tell you?" "No. It has been silent about him." "We just have to wait then," Erel said, sitting down beside Yiel. Yiel turned to his old friend and partner. Erel's face, young and pretty when they had first met was now deeply lined, but still as hairless and smooth as ever. His long black tresses were now peppered with white, unlike Yiel's own hair which had turned gold on his nine hundredth birthday. "I can never tire of this," Erel said as he stroked Yiel's gold hair. "Don't you wish we could go on forever?" "All things must come to an end," Yiel said sombrely. "I'm not quite ready to move on." "I don't think I am, quite. But what has to happen will happen." "We should have at least another hundred years, Yi. That's how long it will take to train up the new Authoruss, assuming he is already here." "He is. I can feel him. I feel something drawing away my strength." "Are you sure it is him and not... not some other being?" Yiel shook his head. "I can't know. I just know that it will not be another hundred years. We must hurry." Oh yes, on other fronts, I may possibly be doing a play next May. Lol. I've just been reading the script, and whilst it's not brilliant dialogue, it's funny enough. 2) The rest of the cast are in Australia so actual physical practices will only be in May itself. I don't know how the rest will work. Skype was mentioned. I managed approximately 1,838 words on day 1, which is slightly over the daily target of 1,667 words per day. I kind of figured out the basic plot of the story, and decided on some names. Deciding on names is a definite plus point, considering that for 2009's piece, I went all the way to the middle of the story before finally naming the main character. Then again, that was semi-intentional (names are helpful, though). It was his funeral. He was sure of it, though he couldn't recall dying. The last thing he remembered was peering into the Forbidden Orb, something every boy around his age did on the sly, when his vision had suddenly blurred. He had rubbed his eyes to clear them and when he could see again, he was here, standing beside his own casket, looking down at his body. It was a fine body, if he could say so himself; somewhat on the short side, but well-built and toned. The hours he had spent buffing at the gym to impress girls had paid off quite well. He wondered how he would survive without it. Bodies were rather comfortable things, now that he had the time to think about it. It lent a lot of weight to one. He wondered that he didn't float away. The boy peered at his own face, impressed at the good job the makeup artists had done. They had managed to conceal all the outbreaks he had been having recently, the red, peeling, pimply skin. They hadn't covered up a long thin scar that ran from his left ear to his cheek though, and he wondered what that was. He was quite sure he hadn't had that scar before he died. Was it something the Orb had done? Subconsciously, he touched his face and was surprised when he found that he could. Was he actually still solid, or was he only solid to himself? He tried to grasp at the edge of the casket, but found that his hand went through the hardwood. It was puzzling. Was he a ghost, or a shade, or something else altogether? He could see Xanthia now, her eyes narrowing as she came into the canopied area. She’d had her eyes on him, he knew, aiming to sink her claws into him as an eligible mate. Her schemes would come to naught now. He chuckled, wondering what she would do if she had to end up with that fool, Luth. Probably go into hysterics and pretend to be suicidal, he guessed. Luth was approaching her now, saying something that he couldn’t quite hear. He watched Xanthia’s mouth move, the look of disdain on her face, but couldn’t make out what she was saying. He took a step closer, concentrating on her lips. “If you boys didn’t have that ridiculous bet, he wouldn’t be dead,” she seemed to be saying. His attention was caught by a frantic movement near his body, and he turned away from Xanthia to find that his mother was wailing over his body – or seemed to be wailing. He couldn’t hear a word she was saying. A frown furrowed his brow. I'm considering putting this up on smashwords under the Nanowrimo program. This basically means that I'll be uploading the WIP probably once in two days as it progresses. This is potentially embarrassing as it will be full of plot holes and awkward scenes, though probably not many typos or grammatical errors (because I always do a proof read at the end of the day). Then again, it would be fun as well. What are your thoughts on this? If I get at least 5 yes-es, I'll go ahead.